Plato was one of the greatest classical Greek philosophers. He lived from 427 BC to 348 BC. Plato created the first university school, called "The Academy". Plato was a student of Socrates (who did not write) and the teacher of Aristotle, who founded another university, known as the Lyceum. Plato wrote about many ideas in philosophy that are still talked about today. He wrote about ideas of deductive reasoning. One modern philosopher, Alfred North Whitehead, said that all philosophy since Plato has just been comments on his works. Plato wrote his books in the form of dialogues with two people or more talking about ideas, and sometimes disagreeing about them. Socrates is usually the main person in Plato's dialogues. Usually, Socrates talks with people about their ideas, and tries to see if they believe anything that is illogical. Other people in the stories often become angry with Socrates because of this. People who study Plato argue about whether Socrates really said the same things that Plato makes him say, or whether Plato just used Socrates as a character, to make the ideas he was talking about seem more important. 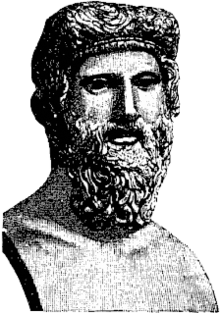 Plato opposed the rhetorics of sophism and insisted on true justice and equality in his work Gorgias, and on immortality of soul in Phaedo. One of Plato's most famous works is The Republic (in Greek, Politeia, or 'city'). In that work, he describes Socrates's vision of an "ideal" state. The method of questioning in this dialogue, called the Socratic method, is as important as the content. The Republic contains ideas of Socrates: "Socrates said it, Plato wrote it." The Laws is Plato's longest dialogue and probably his last. There are many dialogues that were supposed to be written by Plato. This list includes those he probably did write. ↑ Bobonich, Christopher (2010). Plato’s Laws: A Critical Guide. Cambridge University Press. p. 1. ISBN 978-0-5218-84631. Lavine, T.Z. (August 1989). From Socrates to Sartre: the Philosophic Quest. Bantam Books. ISBN 0-553-25161-9.